I've been loving statement sleeves for a while now (remember this post and this post), so this sweater immediately spoke to me. The longer shape and oversized fit made it comfortable for my bump, and the color was right up my alley. 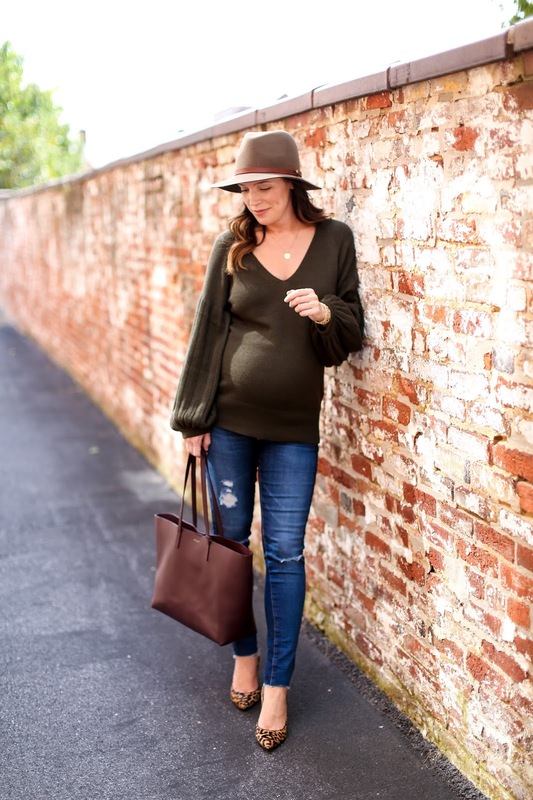 #teamneutrals I've done the rubber band trick throughout pregnancy with many of my jeans, but this pair of maternity jeans is still one of my favorites. They are incredibly pricey but I would buy them over and over again because of how flattering and comfortable they are to wear. 1. Habit - I have worked in the beauty industry since right out of college so I truly believe much of my ability to get ready every day comes from habit. I worked crazy hours (#retaillife) at the beginning of my career and my boss made it clear to me that even if I have to be at work at 6am after leaving the night before at midnight (this was often the case during the holiday season), I was expected to have a full face of makeup, hair done and a presentable outfit. So that became my norm, and this expectation continued as I advanced in my career. I would do my hair and makeup almost every single day regardless of how I felt and would have to factor in that time each day (i.e. running out of the house in 15 minutes was not an option, I needed at least a full hour to get ready so my alarm was always set earlier than I would prefer). Fast forward to now and I find it an automatic to still do this routine almost every day. 2. Remembering how I feel after I get ready - I had a day early on in my pregnancy that I remember clearly where I was feeling so fatigued and nauseous but had a full day of errands and 2 afternoon meetings to attend so I knew I had to attempt to get ready. Later that day, I actually remarked to myself at how much better I felt overall when I was showered, dressed and put together. So I actually remind myself of that when I want to stay in my sweats all day or pass on putting any effort into myself. And while I still take time to rest when I'm tired or stay in bed when I'm truly not feeling well, I can recognize when I'm just being lazy and remember how it will be worth it if I just put the effort into myself to get out/put makeup on/do my hair/wear real clothes. 3. Visiting somewhere I enjoy - Living in NYC for so many years meant that I could run to the store in my pajamas to get something, but there was no way I could hide it. Now that I drive everywhere, I can use that as an excuse to stay in my pjs and do drive-thrus or quick pop-ins to the store. Because of this, I will often make a point a few times a week to go out to lunch at a fun restaurant, work from a cute coffee shop, visit my favorite boutique, etc which gives me a reason to forego the drive-thru/pj fiasco and truly get ready. 4. Comparison (but in a good way) - Comparison can be the thief of joy in many instances, but it can also help put things into perspective in a good way. Over the course of my career in the beauty industry, I worked with a TON of pregnant women. And while I never gave it a second thought at the time, working at a cosmetic counter for 10 (or more) hours a day in heels, full makeup/hair and fitted clothes while pregnant is no easy feat (I realize that now). Many of the women I worked alongside would commute daily for hours on the subway or train, in the worst weather conditions, at all stages of pregnancy while still needing to look fully professional, pulled together and often quite done-up because our job required it. And as my career advanced, I would see many of our top executives working crazy hours while pregnant, all looking their very best because of the industry we worked in and the need to represent the brand in it's best light every day. It's funny how I think about these ladies when I am complaining to myself about not wanting to get ready. Obviously like I said, if I am feeling ill it's a different story, but most of the time I feel fine and use those women as my inspiration. 5. My blog - My final bit of motivation that has helped me through this pregnancy and brings me immense joy on a daily basis is my blog. I love sharing my fashion, beauty and lifestyle choices with all of you who enjoy these things as well, and that passion and excitement for what I do often helps direct my motivation. I also feel incredibly grateful that I have been able to take what was once a hobby for myself and turn it into a business so I don't ever want to take that for granted. I take pride in what I do and want to put the time and effort into my content which allows me to find the motivation each day to push through some of the pregnancy blues. Hope you enjoyed hearing a bit more about how I stay motivated and even learning more about me as a person! And if any of you can relate to these things or they help you find a bit of your own motivation, then that's even better!